The iConnect Mini offers 1-touch photo and video back-up for iPhones, iPads, and iPods with a Lightning connection. In addition, the iConnect Mini has a dual Lightning and USB3.0 connection allowing it to work as a portable media library, storing a whole collection of music, movies, videos, and even data files like pdf, that can be played directly through any Apple device with the Lightning connection or any computer with a USB connection. For added security, the iConnect Mini supports the Apple Touch ID security, using an individual's unique finger print to prevent others from accessing or altering any of your images and videos. The iConnect Mini is the world's smallest flash drive for Apple mobile devices. 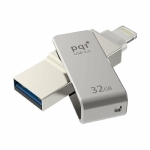 In fact, it's smaller than the average person's thumb, yet it boasts a huge storage capacity up to 128GB, made possible through PQI's exclusive COB 3.0 technology. Compatible with iPhone 6s, iPhone 6s Plus, iPhone 6 Plus, iPhone 6, iPhone 5s, iPhone 5c, iPhone 5, iPad Air 2, iPad Air, iPad (4th generation),iPad mini4, iPad mini 3, iPad mini2,iPad mini, iPad ProiPod touch (5th generation) and newer (iOS 9). NOTE: Please specify color (gold, iron gray or rose gold) in your order comments. If no color is specified, iron gray will be shipped. The iConnect Mini expands your iPhone's storage capacity, especially on the lower capacity 16GB iPhones. The iConnect mini allows you to take more high-resolution 12 megapixel photos, live photos, 4K videos, and store them directly in its memory without using up precious storage on the iPhone's internal memory. The iConnect Mini has an extendable Lightning connector that allows it to stay connected to an iPhone without needing to remove the exterior protective casing. The iConnect Mini allows the user to take photos through an Apple mobile device, such as the iPhone, iPad, or iPod, and store directly onto the iConnect Mini's internal storage rather than using any of your Apple mobile devices internal storage. That way you will not have to worry whether you have enough memory left on your iPhone, iPad, or iPod to capture more pictures. In this mode, all pictures taken will load directly to the iConnect Mini, which you can easily transfer between any supported Apple mobile device, computer, or tablet at anytime without requiring an internet connection or iTunes. The iConnect mini supports the Apple Touch ID feature to safeguard your photos and videos by locking access through fingerprint identification. The PQI iConnect are engineered to meet Apple's design specifications and are MFI (Made for iPhone/iPad/iPod) Certified.